LeRoy Troy - the "Tennessee Slicker"
One of my pleasures in attending the Smithville, TN Fiddler's Jamboree is to see and talk with LeRoy Troy. 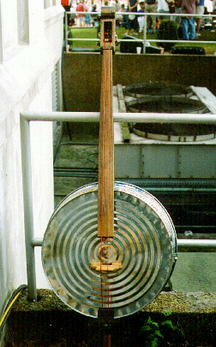 He is a talented and knowledgeable individual who is very interested in early country music. An accomplished performer, LeRoy always has a group around to be entertained and he is gracious and courteous in responding to the many questions about his music. 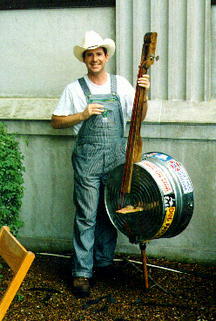 One unusual instrument that LeRoy has is an upright washtub bass. 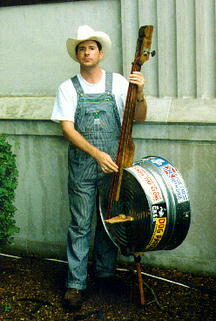 He gave me permission to post the pictures and I know you will want to see him play the bass in addition to banjo and fiddle. Thanks to LeRoy for allowing me to produce this site.